I woke up with this song ('Contact') in my head this morning playing on repeat, so I take that as a sign that it's time to feature it here on this very forum. In fact, I think I was dreaming about listening to it- no surprise, as those three heavenly voices are certainly daydream inducing. 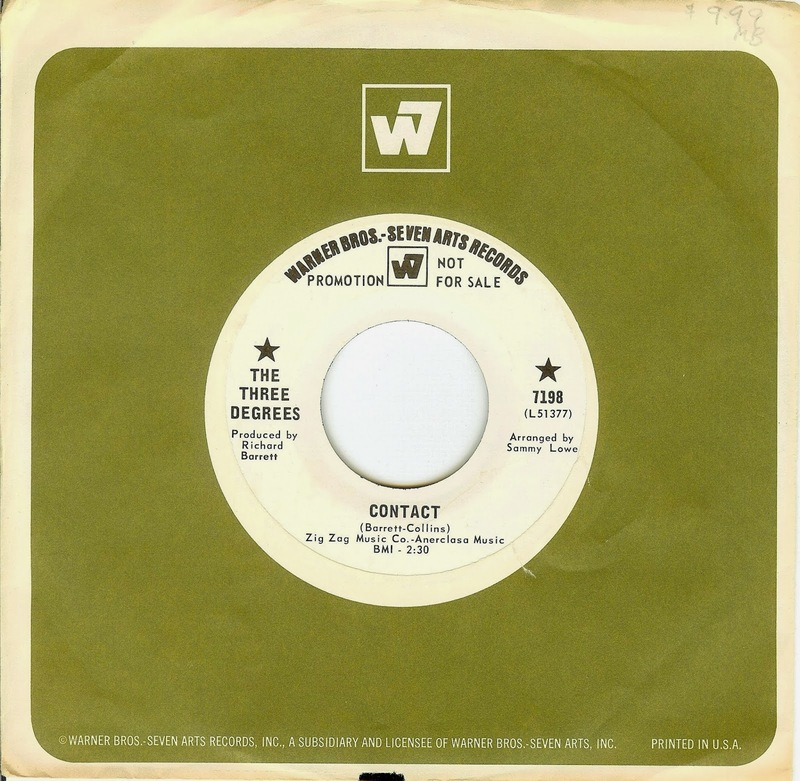 The 3 Degrees formed in Philadelphia in 1963 and went through a few lineup changes before settling into their hit making (and brilliant) mid '70's soul-disco sound. This record is a departure from their earlier Swan releases (which feature a strong Motown influence and also happen to be some of my most cherished girl group 45's), although the same producer (Richard Barrett) was behind the glass. 'Contact' takes the whole space race scene and turns it into something completely poetic, with an arrangement that's complex, swinging and downright mind blowing, thanks to veteran musician/ arranger Sammy Lowe (his arrangements include James Brown's orchestral flights of fancy 'It's A Man's Man's Man's Man's World' and 'Prisoner Of Love', along with arrangements for Nina Simone, Sam Cooke and countless others). The flip side, 'No No Not Again' is another fine example of the soul waltz; a style which was never utilized as much as it should have been, in my opinion, but those records that incorporate it are very near and dear to me. Once again, those heavenly Three Degrees harmonies will melt the ice and warm the heart. This single was a one off for Warner Brothers Records, and perhaps it was just too far out to attain hit status.